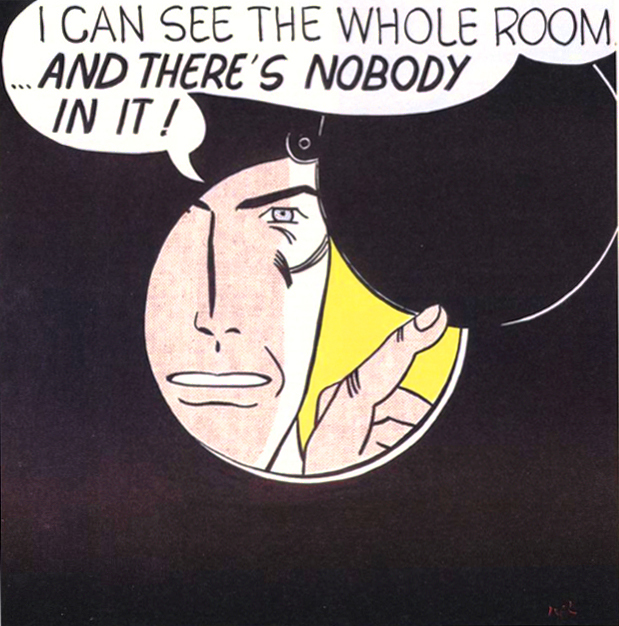 Roy Lichtenstein based his painting I Can See the Whole Room! on a panel from the newspaper comic strip Steve Roper. It is often mentioned that William Overgard, artist on the strip, had a letter published in Time magazine (May 17th 1963) about the painting. It’s a short letter and often quoted in full. The Legion is happy to quote it in full below, this time in the context of the whole section of the letter page devoted to the subject of Pop Art. We were unaware that the magazine had previously run a feature on Pop. (We will endeavour to find a copy!) The letters were responding to that article. We wonder if the balance in the letters Time printed reflects their correspondents’ overall balance of views, or indeed that of the US population of the time. 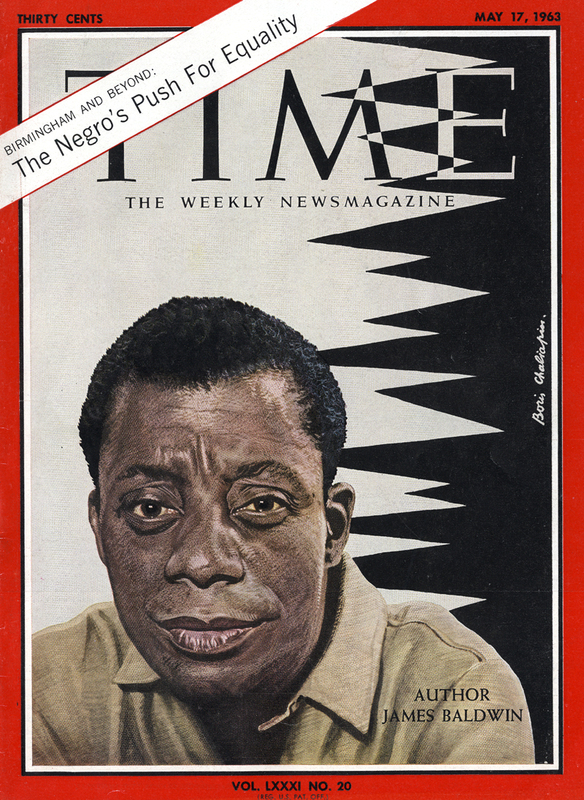 There were slightly more important things going on, as shown by the magazine’s cover story. Birmingham Alabama had been torn by race riots after heavy-handed police responses to peaceful demonstrations against segregation. Pop Art itself probably wasn’t saying a lot about that. Sir: Pop art [May 3] is the most exciting thing that has happened in America since Little Eva tripped over the ice cubes. The Guggen­heim Museum is to be congratulated on its forward-looking policy. Fifty years from now there will be a revival of pop art that will make the recent revival of the Armory Show look pale indeed. JASON A. SPENALZO, Hamilton, N.Y.
Sir: I’m not fooled. I think it stinks. DIANE FRECHIN, Bremerton, Wash.
Sir: As a cartoonist I was interested in Roy Lichtenstein’s comments on comic strips in your article on pop art. 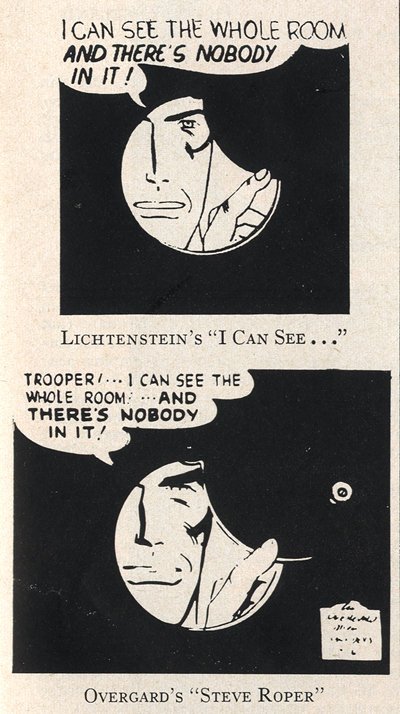 Though he may not, as he says, copy them exactly, Lichtenstein in his painting currently being shown at the Guggenheim comes pretty close to the last panel of my Steve Roper Sunday page of Aug. 6, 1961. Very flattering… I think? WILLIAM OVERGARD, Stony Point, N.Y.
Sir: Well, I’ll tell, you, it was really something ! Since we don’t allow the kids to read war comics, our first problem was to acquire suitable copies. My wife and I worked both sides of the alley for two blocks and finally came up with a couple of good ones out of a garbage can. One was Blood and Bombs and the other Guts and Glory. We started the project at 8 p.m., and by 11 we had cut out and pasted to the walls of our living room 147 panels. These ranged from a buxom nurse giving a G.I. a shot of penicillin to a Com­munist guerrilla with his intestines exposed by mortar fire. The next day I stomped flat eleven empty cans. We stuck mostly to Campbell soup cans, but threw in a sweet potato can and a card­board chow mein container for originality. These I nailed to the walnut paneling above the fireplace. When my wife returned from her trip to a nearby drive-in, we took the hamburgers and a single hot dog and affixed them to the north wall of the dining room, then stood back and threw hot chili and beans over the entire arrangement. No need to tell you that our new art col­lection is the rage of the community. In the past, we had envied our more financially blessed citizens for their expensive art objects. Now we not only feel their equals, but, if my civil suit for the return of two old jackets I gave to the Salvation Army is successful, I sincerely feel that we can take one giant leap up the local social ladder to a position of un­challenged eminence. WILLIAM E. HAFFORD, Tucson, Ariz.
Oh Mr Hafford, you wag. We’ll bet you had the Time readers in stitches. The Legion suspects Mr Hafford and Ms Frechin were more typical of the readership than Mr Spenalzo. Mr H demonstrates the contempt with which comics were viewed by many at the time. He has failed to notice that nurses are now considerably less buxom, and Commies no longer showing their internal organs, in the comic pages, since the Comics Code Authority cleaned up their act in 1954. The Legion says: God bless the Comics Code, china cups and virginity! 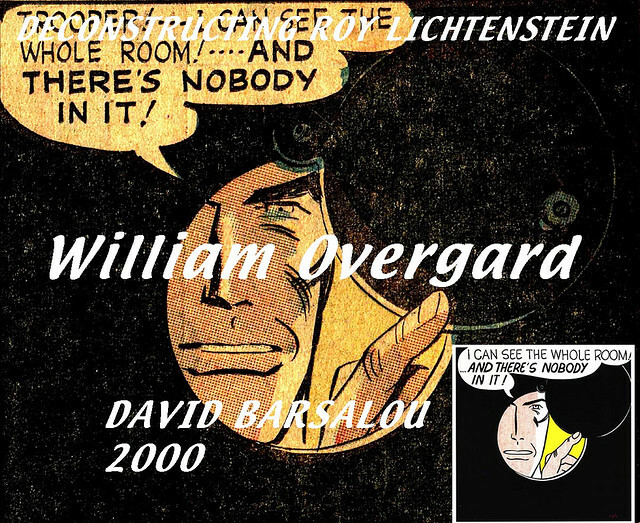 This entry was posted in Gallery art, Newspaper comic strips, Pop Art, Quotations and tagged china cups, Comics Code, James Baldwin, Pop Art, race riots, Roy Lichtenstein, Time magazine, United States, virginity, WILLIAM OVERGARD. Bookmark the permalink.